Audrey’s Doll Gallery is proud of its excellent reputation in doll repairs & restoration. Throughout our 37 years of experience, we have successfully restored all types of dolls, porcelain, vinyl, metal, paper mache, and our specialty; composition. Where total restoration is required, we carefully sketch & capture in photograph the details of facial painting in order to replace as original as possible with color matches, proper strokes, curves and lines of brows, lashes, lips and hairlines. 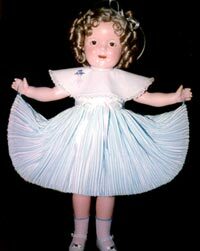 We replace crystallized lenses in the eyes of dolls such as the 1930’s Shirley Temples, etc. We replace porcelain parts when breakage is too severe to warrant restoration. General clean-up and removal of ink and other stains, restringing, replacement of wigs, re-attachment of arms & legs, copy and replacement of cloth bodies, and new outfits made to order are regularly performed “miracles” by our well-trained “hospital” personnel. Seldom have we encountered a “hopeless case”. Please view a few of the examples from our before & after picture album and contact by email or give us a call at 803.356.8414 for your estimates to restore your special dolls. For our customers desiring an in-person consultation, please call in advance to arrange for an appointment. Visit our Featured Repairs page. Before and After pictures below.